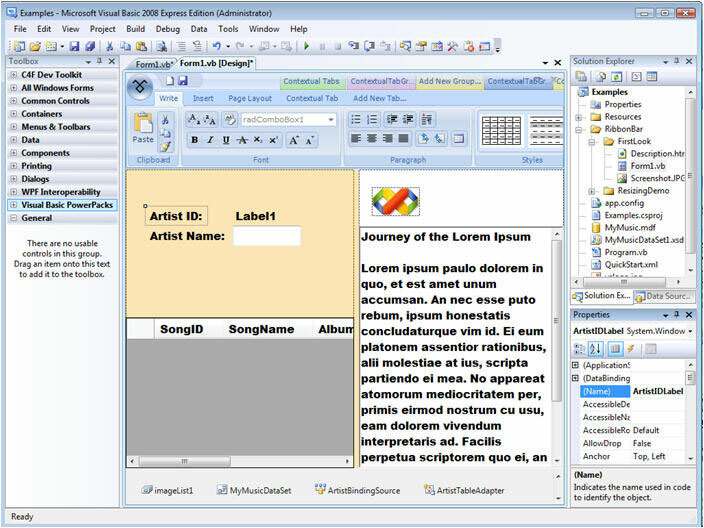 Visual Basic 2008 Express Edition is a no-cost, streamlined, easy-to-use development tool for hobbyists, students, and novices. The Express Edition makes Windows programming with Visual Basic fun and easy to learn. It’s also the perfect way for experienced Visual Basic developers to try out new features. * Easily design great-looking and easy-to-use applications using an intuitive, drag-and-drop interface designer. * Built-in support for Windows XP Themes lets you easily create applications with a Windows XP look and feel. * Over 30 new controls simplify development. * In-place menu editor enables quick and easy creation of main menus and right-click context menus. * “My” namespace provides intuitive access to common functions—working with files, accessing the registry, and utilizing applications settings and resources. * Code colorization, syntax checking, and IntelliSense provide an intuitive development experience. * AutoCorrect can suggest and apply fixes for more than 230 common programming errors. * Don’t write that code yourself! Visual Basic Express can write it for you with over 400 built-in IntelliSense code snippets that provide templates for common coding tasks. * “Drag and drop” data from your database onto your Windows application to easily create fully-functional data-driven applications. * Create data-enabled applications using SQL Server 2005 Express. * Visually design queries and databases using the built-in database design tools. Wonderful site, I had not ran into this before during my queries! Continue the wonderful work!